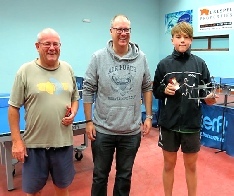 On 29 October, 2018 Alfie Sutherland won the Autumn Handicap, beating Mick Molyneaux in the final. 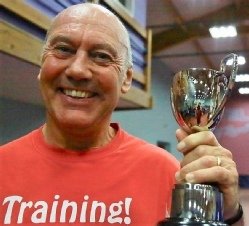 This is a new competition, so in winning Alfie is the first winner of the trophy dedicated in memory of a stalwart of Jersey Table Tennis - the late Ed Le Quesne, MBE. A busy hall saw 24 players take part, with a range of players from all the divisions of the Investec League and a few social only players. Each player received a handicap based on either their league form or their social playing standard. The aim of a handicap tournament is to give anyone a chance of winning and to have some very close games. The quarter finals saw a good mixture of the divisions represented, which saw Peter Hinds from Division 2 reaching the semis at the expense of Hannah Silcock from Division 3 and Jon Webster from Division 3 winning through against Jeff Vincent. 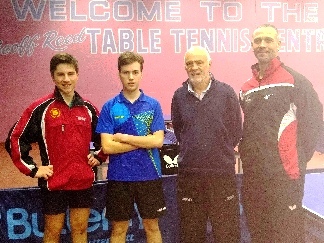 Jon had a close game with Division 1's Alfie Sutherland in the semi as did Mick Molyneaux with Peter Hinds. 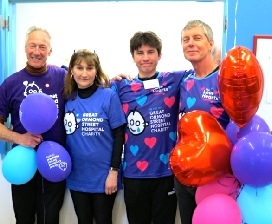 All proceeds raised were donated to CHRISTIAN AID, a charity that Ed spent many an hour raising funds for. 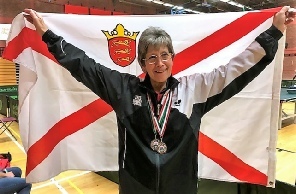 Jersey entered the Home Countries Veterans Championships for the first time at the Sport Wales National Centre in Cardiff on 7-9 September, 2018. 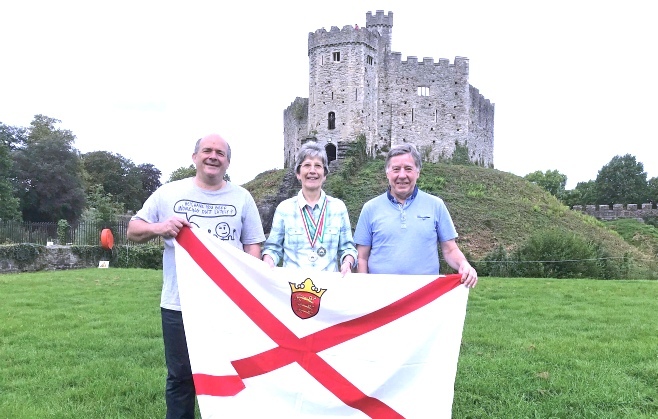 Entrants were from England, Scotland, Wales, Ireland, Isle of Man and Guernsey. The 60's Team entrants for Jersey were Kay Lefebvre, Paul Routier and Martin Tupper. 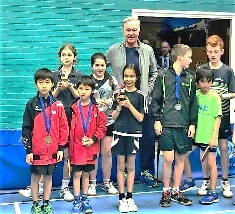 We had good success, especially Kay who won Silver medals for both the individual singles and doubles. The team did well in beating Guernsey and the Isle of Man and also a close 4:3 loss to Wales. 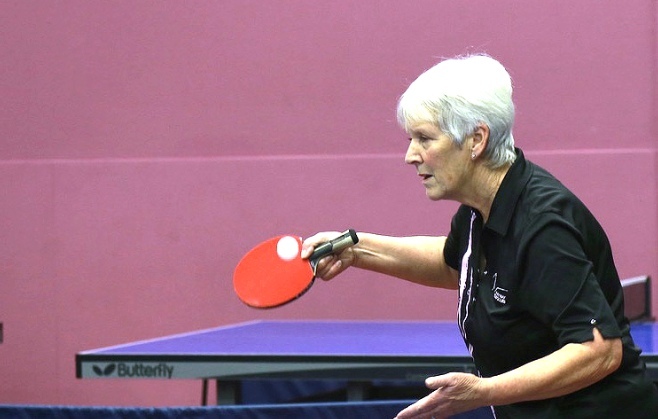 This was a new competition in memory of Geoff Reed and took place at the Geoff Reed Table Tennis Centre (GRTTC). All donations went to EYECAN (formerly the Jersey Blind Society). Last night, Eugene ‘Yogi’ Ellis rolled back the years to win the inaugural Magicball Cup by defeating Tyler Gosselin 3-0 (14-12, 11-6, 11-8) in the final. 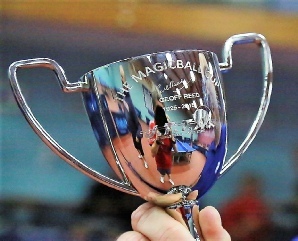 The Magicball Cup a new competition held by the Jersey Table Tennis Association in memory of the late Geoff Reed as a curtain raiser for the new season. Why Magicball? 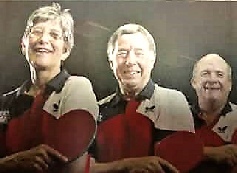 Firstly Geoff already has a table tennis centre named after him thanks to his generosity in securing the premises at FB Fields and secondly, Magicball was the theme tune for the 1997 World Table Tennis Championships held in Manchester and was a favourite of Geoff’s. The nature of the competition was competitive but friendly, with players of all ages and abilities from across the Association drawn into 9 groups with the winner and runner up from each advancing to the knockout rounds. The competition was quite open with Liliana Andrade, Kathryn and Hannah Silcock leading the way for the junior girls into the knockout rounds, Hannah narrowly missing out on the opportunity for a place in the quarter finals. The quarter finals saw Martin Tupper edge past Mick Molyneuax to secure a semi final berth against Tyler Gosselin who overcame Chris Pursley. In the bottom half of the draw the Association’s new President, Paul Routier MBE, missed out against Jack Mills for a place in the semis against Yogi who beat David Le Clercq in his quarter final. Tyler won his semifinal to set up a final against Yogi. 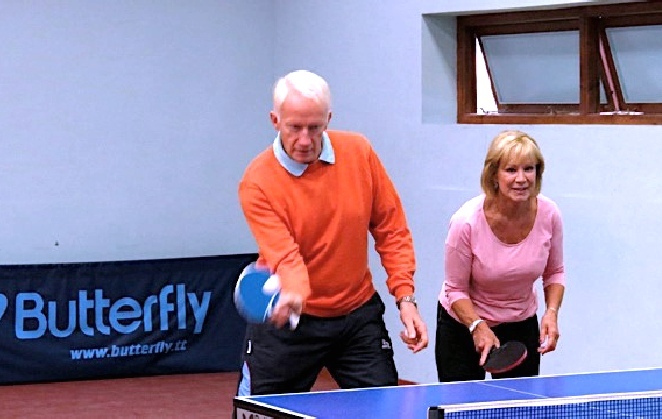 It was almost as if it were scripted for Yogi to reach the final of the Magicball Cup as Geoff had been his coach, mentor and friend, with Yogi having won numerous Island and Channel Island titles over the years at both junior and senior level with Geoff in his corner coaching him. Despite the fine efforts of Tyler, nothing was going to stand between Yogi winning the trophy, with all present recognising the symbolic nature of Yogi’s win and a fitting way to start our new season. The Investec League starts on 1 October 2018. Follow the British League link to keep up with Luc Miller and Jack Mills, who qualified for Jersey's first season in the Senior British League. Hannah Silcock entered from Jersey in this event in Lisburn, N. Ireland with coach, Paul Silcock. 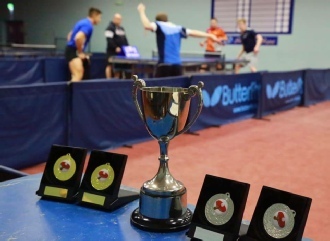 The event brings together in team and individual competition the best 48 young table tennis players from primary schools in England, Scotland, Wales, Guernsey, Jersey, Isle of Man and Ireland. 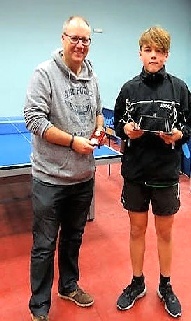 CONGRATULATIONS to Hannah Silcock for finishing runner-up in the final. 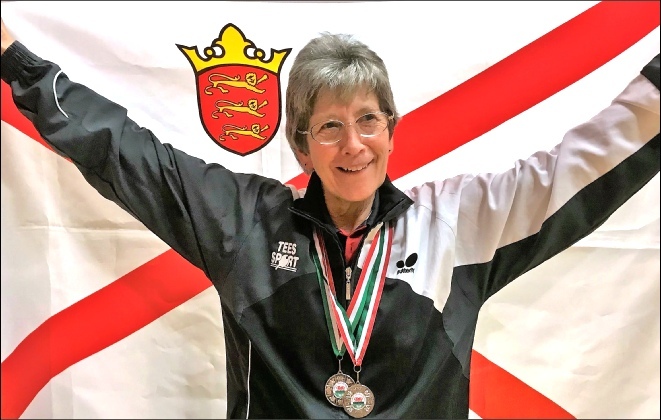 There were some good wins against the top players from Scotland, England, Ireland, Wales, Guernsey and the Isle of Man and she lost the final to Ruby Elliot, Wales No. 1, in an exciting 4 set final. 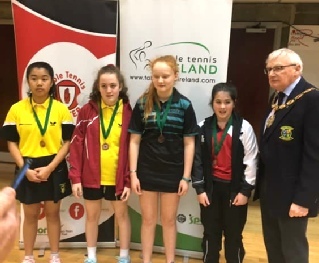 Hannah had a strong two days winning all the singles games against the top 2 seeds of England, Ireland, Wales and Guernsey. She won against the Scotland No 2 seed and her only defeat was a 3-2 loss against Scotland No 1. Thanks to Maggie Mulhern from the Isle of Man who coached the mixed girls team that Hannah was part of. The Island Champions hips sponsored by INVESTEC came to a close on Saturday at the Geoff Reed Table Tennis Centre, FB Fields. CONGRATULATIONS to all the winners. Our patron, His Excellency the Lieutenant-Governor, made the presentations. Please follow the link for the results and photos taken by Paul Routier and Mike Lefebvre. Following their success in February, the Jersey team represented by Jack Mills, Luc Miller, Chris Morshead and Max Tupper did well in Harlow. 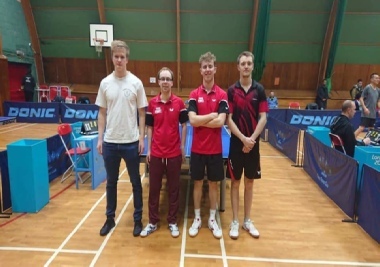 Success on Day 1 of the final weekend in the British League for the Jersey men’s senior team. Luc Miller, Jack Mills, Chris Morshead and the well-known Jersey player Liam Squirell secured a 9-0 win against Batts in Harlow. Jersey then went on to beat the previously undefeated league leaders “Table Tennis Fight Club” 7-2. 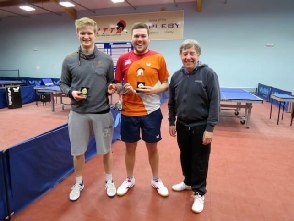 CONGR ATULATIONS to Chris Morshead and Tyler Gosselin for winning the Divisional 1 Doubles Competition against Jack Mills and Mariusz Cieminski on Wednesday evening. 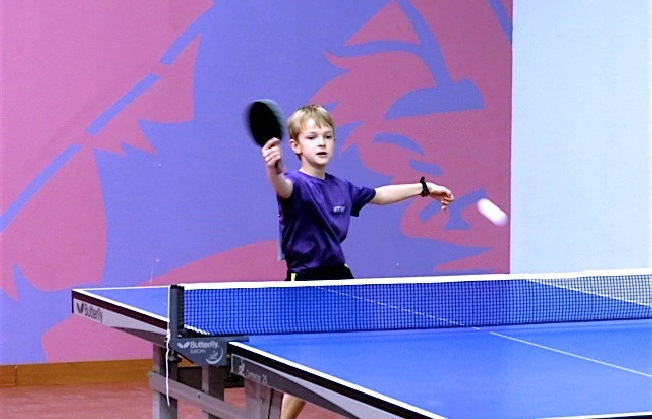 In Group 1 the top seeds of Jack & Mariusz qualified winning all three games without dropping a set. 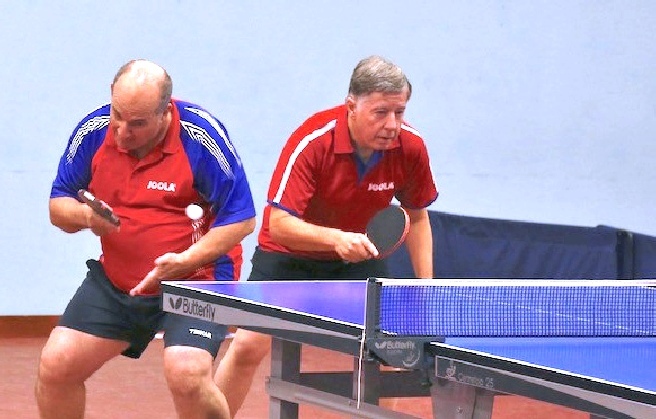 The veteran double pairing of Paul Routier and Martin Tupper also progressed by winning 2 of their group matches. 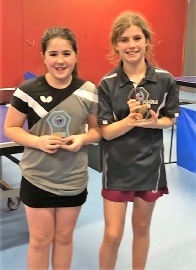 It could have been different for them as their opening match was against the girl’s team of Irene Bree and Kathryn Silcock. The girls raced to a 2-0 lead before the elder statesman pulled on their 120 years of ???? experience to win 3-2. Rob Blackmore and Ruben Legge picked up 1 win in the group against but did not hit their normal level of performance. Onto group 2 and Tyler and Chris qualified as winners of the group with 3 wins. The match of the group though involved Tanguy & Thomas playing Chris and Tyler. The young pairing raced to a 2-1 lead before Chris and Tyler composed themselves to win 3-2. (13-15, 11-7, 6-11, 11-6, 11-3). Leon Pierre and Alfie Sutherland played well to qualify as runners up with 2 group wins including a close game against the young girls pairing of Liliana Andrade and Hannah Silcock. Onto the semi-finals and Tyler & Chris played some good stuff to progress 3-0 against Paul & Martin (11-3, 11-8, 12-10). 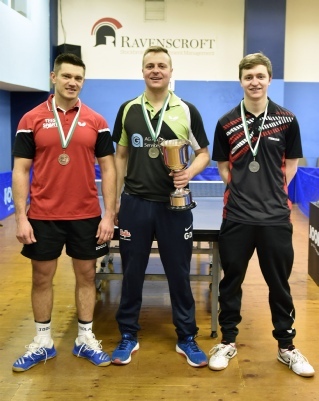 In the other semi-final the experience of Jack and Mariusz also progressed 3-0 (11-4, 11-8, 11-7) against Leon & Alfie. Onto the final and Mariusz and Jack did not manage to maintain their form of earlier in the evening and Chris & Tyler recorded a 3-0 win to take the trophy 11-4, 11-9, 11-8). Thanks to Duncan Mills for organising the competition. Jers ey sent a team of six juniors to the Eggbuckland Community College in Plymouth to compete in the U13, U15 and U18 events. The Jersey team were Kathryn & Hannah Silcock, Pia Gurner, Liliana Andrade, Leon Pierre & Noah Risby. The JTTA lead coach was John Barden. The trip was organised by Audrey and Martin Tupper. 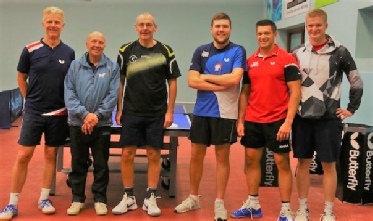 As well as the actual tournament on Sunday, 17 February, a training session was organised on Saturday, 16 February, with other juniors from Plymouth and Brighton under Paul Whiting, a UKCC Level 4 Coach, to gain valuable experience in training and competing against new playing styles. This was great experience for the Jersey team. Pia and Kathryn winning their first matches in a UK tournament when playing Under 15’s and Under 18’s! (Both only 13)! Liliana and Hannah both beating the current Wales No 2 (U13). Great performance by Liliana. 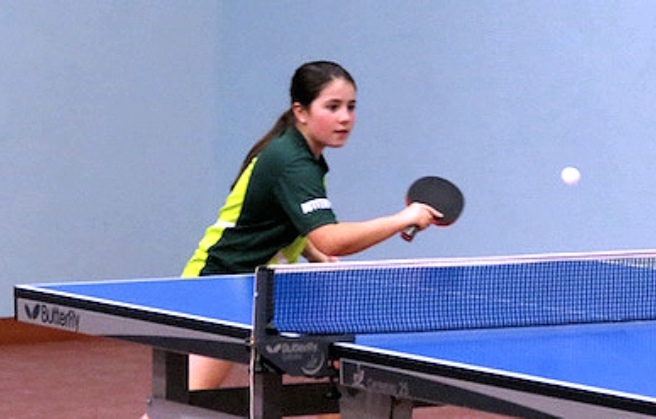 Liliana finishing 3rd in the Under 13’s and some great wins at Under 15’s. Hannah winning under 13’s and Under 15’s tournament including one win at 2-2 and 10-6 down! (Won 11 out of 11). Noah playing some great stuff at under 15 and qualified to KO in Under 18 consolation! 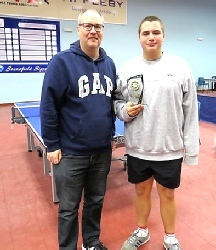 Leon got to U15 QF before getting beaten by eventual winner and qualified out of under 18 group before losing in last 16. The team representing Jersey were Jack Mills, Luc Miller, Chris Morshead and Max Tupper. 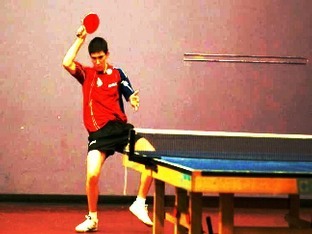 In the Senior British League. Follow the SBL link for their progress. C ONGRATULATIONS to Tanguy Billet-Masters, Thomas Cotillard, Terry Shaw and Duncan Mills for recently gaining the new JTTA UKCC Level 1 Session Coach Award. 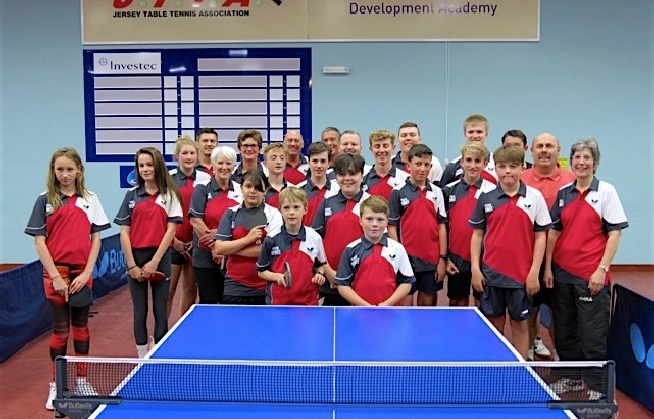 They were tutored by Vidal Graham and assessed by Aled Howell of Table Tennis England and are being integrated into the existing JTTA coaching team. Jersey’s Top 12 qualifiers competed in the Guernsey CI Open Top 12. 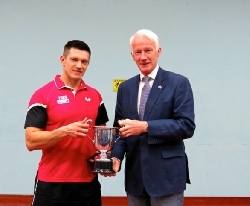 Gary Dodd of Guernsey won his 9th title with Marius Cieminski being Jersey’s top player in third place. Ken Quirk’s Bat & Ball team came over to compete against Jersey and won 43 to Jersey’s 37.